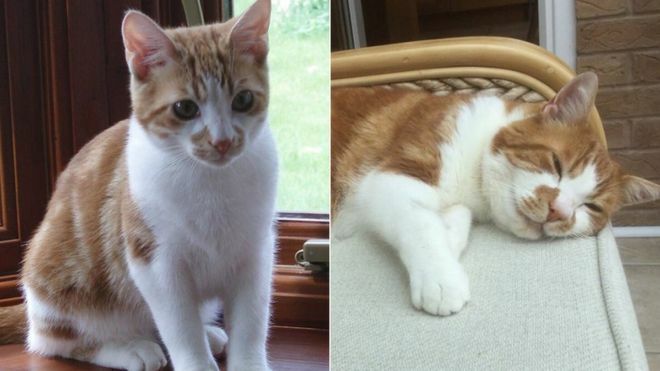 Harry the cat disappeared from Mark Salisbury’s former home in Ipswich, Suffolk, in 2008. Mark had adopted Harry and his brother back when he was in his 30’s. One day, Harry disappeared and Harry’s brother’s behavior changed to become more clingy. Then ten years later, the Ipswich branch of the Blue Cross contacted Mark and told him that Harry had been found. Apparently someone had taken Harry in and when that elderly owner passed away, Harry found himself in the charity, which scanned for a microchip to help reunite Harry with Mark once more. Mr Salisbury said he “could never quite bring myself to cancel the microchip” even after ten years. To increase your odds of reuniting with a lost pet, get your cat microchipped today. To read more about the cat reunited with its owner after ten years, click here.